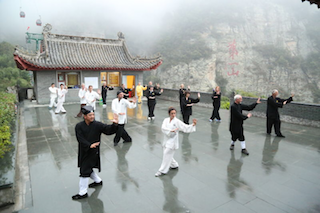 Gordon Faulkner is the Director and Principal Instructor of the Chanquanshu School of Daoist Arts, a school that teaches Yangsheng (nourishing the vital principle) practices that cover martial, medical and meditational arts. Recognised for his outstanding abilities in these fields in both the West and inside China, in the early 1990’s he was invited to study the Daoyin Yangsheng Gong system with Professor Zhang Guangde (one China’s ‘national living treasures’) of the Beijing University of Physical Education. Later he became one of the first Westerners to be qualified as a Senior International Judge certified by the China Daoyin Yangsheng Gong Association and the China Wushu Society. Later still, in an official ceremony held at the same university, Professor Zhang accepted him as a closed door disciple (Ru Shi Di Zi) and made him a successor to the Daoyin Yangsheng Gong lineage, where he has been encouraged by the university to start production of health routines for the western climate. He is the President for Scotland & Wales in the European Daoyin Yangsheng Gong Federation, Specialist Advisor to the UK Qigong Teachers Association and for a time he was part of the International Healing Tao organization and was a Director of the European Healing Tao Instructors Association. Gordon Faulkner has taught throughout Europe and the USA and regularly gives seminars at Traditional Chinese Medicine conferences. On the therapeutic side Gordon is a practitioner and teacher of Chinese Therapeutic Massage. Named ‘You Lisu’ at a ceremony at Wudang Mountain (the birthplace of Taijiquan) he became a disciple of Master You Xuande and was inducted as a 15th generation master of Wudang boxing. Gordon is an Armed Forces Veteran with 22 years’ service in the Royal Air Force and in that time has had martial training with, been trained by, and ultimately trained members of all branches the British Armed Forces. He was a founder member and General Secretary of the Royal Air Force Martial Arts Federation until retirement from military service. He is a Fellow of the Royal Asiatic Society and a member of the Society for Anglo-Chinese Understanding. Author of the award-winning book ‘Managing Stress with Qigong’ from Singing Dragon Publications. The exercises in this book are in use in several Maggie’s Cancer Care Centres. 1. The TCM Fuzang Amno (internal organ massage) techniques for removing congestion and stagnation in the lower abdomen. This work is particularly valuable for opening the lower dantian and allowing greater flow of energy from the centre. 2. A routine from the Daoyin Yangsheng Gong system for dealing with stress. There are two stress routines, Weiji Yufang Gong for stress prevention (yin form) and Weiji Xiaochu Gong for stress relief (yang form). These routines are now used in several Cancer Care Centres in the UK. The Weiji Yufang Gong is the physically easier one to do.